"Like" Lenovo Malaysia. No purchase required. Count the number of squares in the Ketupat picture given. Fill in your details together with your answers in the entry form. The winners will be selected based on the accuracy of their answers. FB SHARE the contest on your page and invite 5 friends to join. 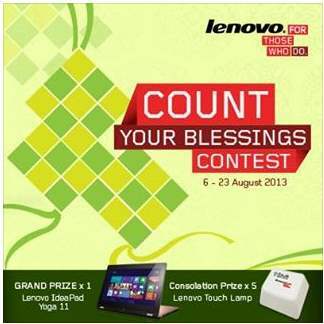 Visit Lenovo Count Your Blessings contest page for more details.